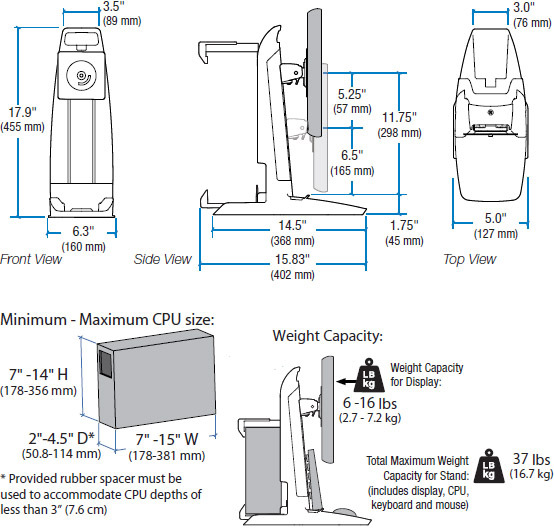 Add ergonomic adjustability and portability while saving space with this unique all-in-one stand. Ergotron 33-338-085 includes a Secure Clamp (SC), adjustable CPU holder. The perfect accessory for space-constrained areas, it enables you to mount both a CPU and display while providing effortless height adjustment of the monitor. Question: Can Dell OPTIPLEX 7010 small form format work with this stand? Answer: Yes, the Dell Optiplex 7010 small form factor will work with this stand. Weight Capacity 6–16 lbs (2.7–7.2 kg) for display; total stand capacity = 37 lbs (16.7 kg) for combined weight of display, CPU, keyboard and mouse.